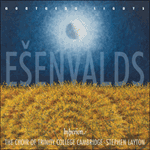 The Trinity Te Deum is a re-imagining in Ešenvalds’ terms of the Anglican tradition of ceremonial music for a grand occasion. It was commissioned for the Installation of Sir Gregory Winter as Master of Trinity College, Cambridge, on 10 October 2012. This brief and brilliant hymn of praise opens with flashing fanfares from brass and organ, the choir’s declamation by turns jubilant and hushed before a ‘magical’ organ modulation leads to a contrasting centre. Anchored by an eternal drone, and flecked with harp decoration, this has the air of both a gentle, stately dance and a naive folksong. The tripartite structure of the hymn is respected with a return of the opening material but this is the briefest of reprises (the text is truncated too): three ecstatic shouts of ‘Holy’ and the rejoicing is done.